LOVE MOVEMENT is an art show using vinyl toys to deliver universal messages about love. 48 backers pledged $3,375 to help bring this project to life. The finished works from Japan, America, Australia and Europe will be exhibited at SUPERFROG Gallery in San Francisco. LOVE MOVEMENT is free and open to the public from December 11th through January 16th. Shin and Nao are flying in for the opening reception, which will feature original art toys and canvases, a Japanese beatboxer, live painting by Shin and animation by Shin & Nao. LOVE MOVEMENT is Shin & Nao's first major art show in the US. 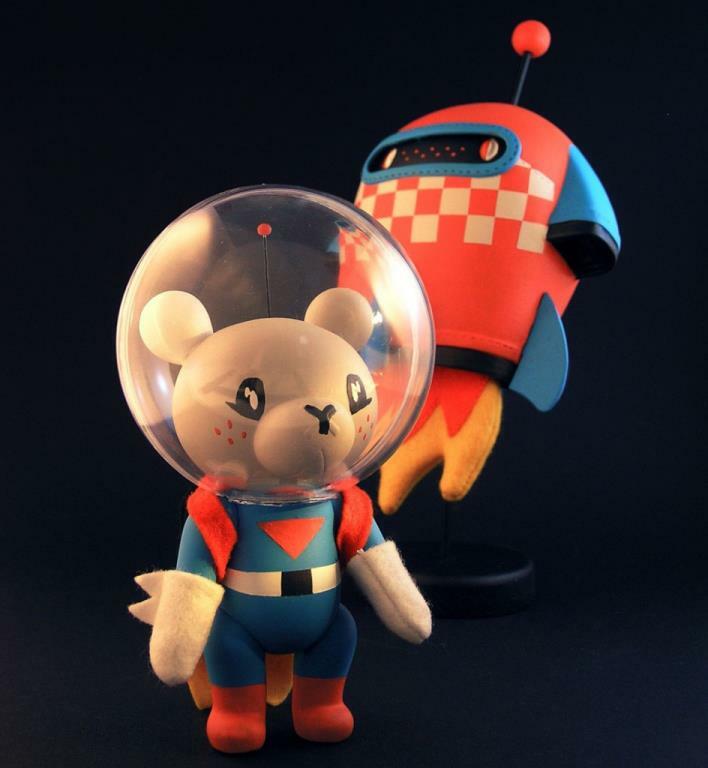 They used their own money to manufacture and ship 100 vinyl toys to other artists. Shin and Nao view their figures as little messengers of love. I am organizing this show for them. Join the Love Movement! We are hoping to raise $3,000 for Shin and Nao's airfare from Tokyo and a place to stay near the gallery in San Francisco. If we are lucky enough to receive more, your contributions will help pay back the costs of manufacturing the toys in Japan ($3,500) and shipping them around the world ($1,500+). Shin Tanaka's Danke Boy and Schoen Girl paper toys can be downloaded with your $10 pledge! Shin Tanaka will paint you and your love's name on the gallery wall (amongst other goodies) for your $100 pledge or send you a digital image of your first name for your $25 pledge! Wear your heart on your sleeve (sort of) in an exclusive LOVE MOVEMENT T-shirt for a $50 pledge! Bask in the loving glow of your own unique, hand-painted vinyl art figures by Shin Tanaka. See pledge descriptions on sidebar. The Creators Shin Tanaka is a Tokyo-based artist with roots in the graffiti scene. Using the experience of origami from his youth, he created toys out of paper. To date, over 500 artists and brands have joined his paper toy project, and fans around the world print, cut and assemble his designs. Shin has made paper sneakers for the NIKE Design Library in Portland and paper kimonos for The Museum of Far Eastern Antiquities in Stockholm. In 2009, he blended elements of fashion, art and hip-hop for his first vinyl figure, T-BOY. His work is sought after by top brands including Issey Miyake, Scion, Disney and UNIQLO and has been shown in Berlin, Paris, Hong Kong, Shanghai, Osaka and Tokyo. Nao Shimojo majored in music at the Tokyo College of Music and briefly studied abroad in Vienna. Filled with inspiration, she returned to Japan and immediately reached out to TOUMA to create the mascots, Kurokuma (Black Bear) DANKE and Shirokuma (White Bear) SCHOEN. Nao opened the DANKESCHOEN online shop in 2008 and became incorporated in 2009. That year, she released the first DANKESCHOEN soft vinyl figures, which sold out immediately. In April of 2010, the DANKESCHOEN exhibition,”100% FREE,” debuted in Taiwan featuring the mascots customized by world-famous artists, like tokidoki [see video]! Are these toys or are these art? That is the eternal question! Designer toys have roots in late 1990s Hong Kong when Michael Lau began modifying GI Joe figures to look like his street-savvy friends. Eric So and Jason Siu also fused figures with fashion, further urbanizing and abstracting them. 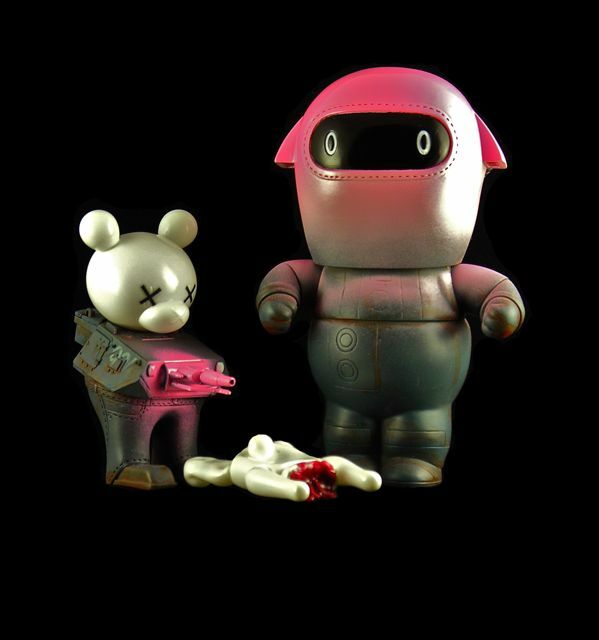 Bounty Hunter (Japan), James Jarvis (UK) and KAWS (US) helped shape the genre around the world. A decade later, the concepts of DIY and affordable art are more resonant than ever. Shin and Nao have been active in street and toy art in Japan for many years and appear in the Encyclopedia of Kaiju. Anne & Scott Wilkowski, Arbito & Snaggs, Ayumi Urayama, Ben The Illustrator & Fi O’Brien, Bert Gatchalian, Bob Conge, Brian Flynn & Dora Drimalas, Bwana Spoons, Chino, Chota Akatuki, Colin & Sas Christian, cozy robot & bonkydog, Devilrobots, Drilone, Dustin Cantrell, ECONECO & SAI, Emilio Garcia, Eriko Ito, Ferg, Frank Kozik, Gary Ham, Hiro Hayashi, Huck Gee, Jason Freeny, Jason Siu, Jermaine Rogers, Jon Burgerman, Jon Knox, Julie West, Kaijin, Kanna Inoue, Karogaro, Ko-Hei! Arikawa, Le Merde, LouLou & Tummie, Mark Nagata, Matthew Waldman, MCA, Mike Slobot, Mr. & Mrs. Leecifer, Nathan Jurevicius, Noferin, Phokos, Sally & Josh Handy, Satoshi Yoshioka, Scott Tolleson, SergeySafonov, Shin Tanaka, Sho Murase, Skinner, Superdeux, Skwak, TADO, Task One, Touma, Toybot Studios, WeAreObjects & A. Bamber, Yosiell Lorenzo, Yucachin, Yu Tihara, 460, and more. You get the above, plus you get the URL links and passwords for Danke Boy and Schoen Girl paper toys (pictured at left). Download the PDFs and print, cut and build your own adorable matching Danke Schoen figures! You are a leader in the LOVE MOVEMENT! You get our effervescent gratitude, the paper toys, a digital file of your name in Shin's writing, a LOVE MOVEMENT exhibition T-shirt, AND Shin will paint your name and your love's name on the gallery wall! Please keep it short & sweet. For example: "Shin & Nao," "Jeremy & Greta," "Garfield & lasagna". The mural will be on display throughout the whole exhibition, from December 11th to January 16th. We will send you a hi-res photo of the mural. Not only are you a leader in the LOVE MOVEMENT, but you enjoy a bit of mystery. Your pledge of $125 entitles you to all the abundance of the $100 reward PLUS you will receive an original 4x6 ink on card drawing by Moscow-based toy artist and illustrator, Sergey Safonov. Sergey is one of over 50 designers participating in LOVE MOVEMENT. Not only are you a leader in the LOVE MOVEMENT, but you're also a colorful character. Your pledge of $150 entitles you to all the abundance of the $100 reward PLUS you will receive an original 4x6 watercolor painting on card by Moscow-based toy artist and illustrator, Sergey Safonov. Sergey is one of over 50 designers participating in LOVE MOVEMENT. This special reward gets you one unique vinyl Dankeschoen bear hand-painted by Shin Tanaka. The Dankeschoen bear was designed by TOUMA and produced by Nao as her toy company's mascot. These figures are one-offs, and no two will be alike. A genuine treasure of toy art! This special reward gets you one unique vinyl T-BOY figure hand-painted by Shin Tanaka. T-BOY is an original character designed by Shin. These figures are one-offs, and no two will be alike. 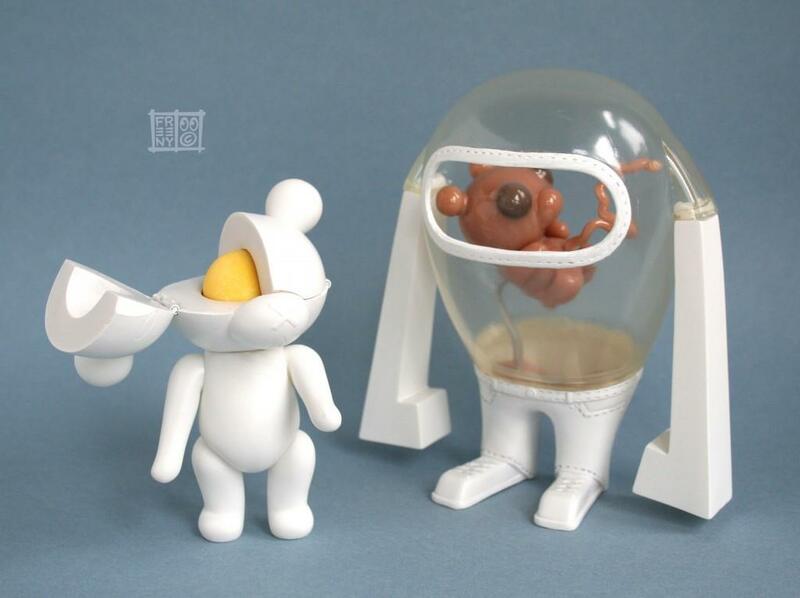 A genuine treasure of toy art! You are LOVE INCARNATE. This is for all our love. You get our utmost gratitude, the paper toys, a digital file of your name in Shin's writing, a LOVE MOVEMENT exhibition T-shirt, your name and your love's name painted on the gallery wall AND...this special reward gets you one unique vinyl Dankeschoen bear AND one unique vinyl T-BOY figure hand-painted just for you by Shin Tanaka. With this reward only, you can specify a color palette for the custom figures Shin will make for you. You will be the envy of anyone with eyeballs and have a special piece of the LOVE MOVEMENT in your own personal collection.